Heavenly Father, you know so much more than we do about the complications surrounding the United States-Mexico border issues. You have infinite wisdom and know exactly what is best. We, frail humans who tend to focus on our own needs before others' needs, do not know what is best. We seek answers, we make attempts, we formulate opinions, we pray for the best. 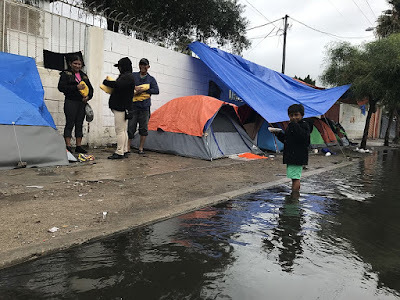 There are so many things to pray about, but today we focus on the migrant shelter declared unsanitary in Tijuana. First, we thank you that the shelter has been closed and that the unhealthy conditions were acknowledged. Second, we are grateful there is another place for people to go–a place with a roof and a dry floor. We pray for the relocation of migrants depending on this shelter to go smoothly. We pray for conditions to remain safe and healthy within the new building. And, Lord, we do pray for the needs of those who have sought shelter in Tijuana and who hope for asylum in the US. You see their hearts and know their situations. Please meet with them, grant them hope, guide them to what is best for their futures. We also ask for grace and wisdom for all leaders involved in this situation—on both sides of the border. In Jesus’ name we pray, amen.